Since moving to Spain, I’ve had quite a few conversations about beer with Spaniards and with other guiris (foreigners) like myself and it never ceases to amaze me how much Spaniards tend to love their beer while foreigners like myself seem to think ‘ehh.’ Like most everything, though, the reality is that beer, the consumption of beer, and even the way in which people think about beer is in fact a cultural concept so this shouldn’t actually come as a surprise. Let’s dig a little deeper, shall we? With beer this affordable, it’s no wonder Spaniards seem to pair it with everything! One thing you’re sure to hear soon upon arrival (or perhaps before) is just how cheap beer is in Spain. Of course, everything should be considered in tandem with local factors and the reality is that the cost of living (and thus the average salary) is much lower in Spain than other countries like the US. Still, even Spaniards will admit that beer is quite affordable (generally less than 3€ for bottled beer and closer to 1€ for what’s on tap). I feel that this factor has a variety of implications on the other factors. 1.) Because beer is so affordable, it makes sense to have it regularly and enjoy it with the average lunch or dinner. 2.) Because beer is generally enjoyed alongside a meal, its flavor is therefore expected to compliment, not overpower, the food. Of course, not all beer is the same and you can certainly find different varieties of the standard beers (ie. Alhambra makes Alhambra Especial, Alhambra 1925, Alhambra Reserva Roja, etc) as well as many more craft beer companies popping up around Spain. However, the general consensus I’ve reach through conversation with fellow beer-drinkers is that these sorts of beers appeal much more to foreigners than to Spaniards, who tend to be partial to the standard pale lager variety that is available on tap (generally between 4-5% alcohol by volume, to give you an idea of the strength). We’ve talked about this previously but it certainly deserves a second mention when trying to understand the Spanish beer culture. Unlike in the US and many of our English-speaking countries, here in Spain one does not (usually) drink beer simply to get drunk. 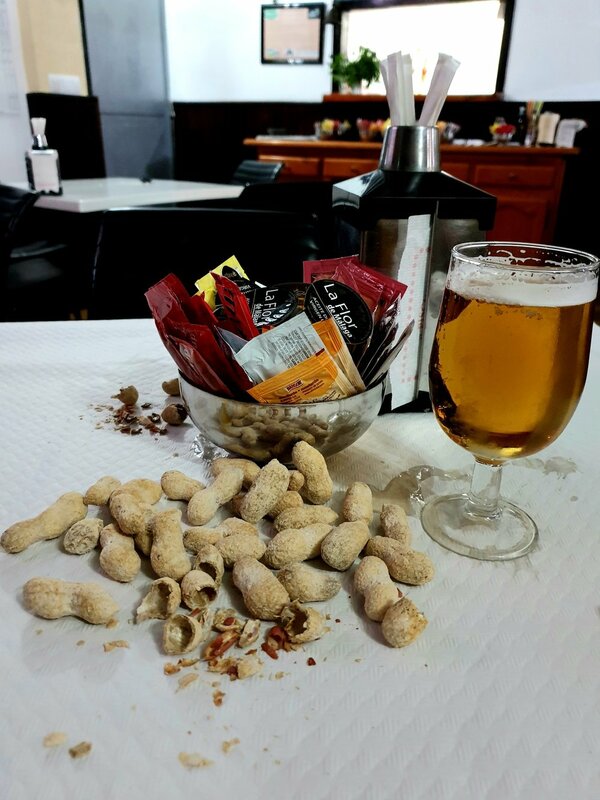 Sure, Spaniards have a time and a place for getting drunk too but generally beer is drunk alongside a meal or hand-in-hand with some tapas, usually with friends/family and some long conversation. Thus, beer is often viewed as something to accompany these sorts of quality time. Considering that Spaniards are notorious for having long meals it’s not surprising that a meal may involve 3 or 4 beers because that meal is generally spread out over 2-3 hours. In short, beer consumption seems to be less about simply drinking beer and instead is more of a by-product of a culture in which food, family, and taking things slow is valued. Drinking beer with food (usually more substantial food than peanuts) can alter your expectations. Taking all of the above into consideration, it’s rather clear that Spaniards and foreigners (generally) have grown up in societies with distinct relationships to beer and therefore different measures and expectations. For example, I personally grew up believing that lagers (i.e. Budweiser, Miller, and the like) were for casual drinking at barbecues, ball games, or with a weekend dinner but that wheat beers, IPAs, Belgian beers, and other craft beers were for “really enjoying beer.” Therefore, I think of a strong flavor and, admittedly, a higher alcohol content as a sign of a beer’s quality whereas I get the impression that the average Spaniard does not. Whenever I get into a discussion of what is a ‘good beer,’ the Spaniards I’ve spoken to tend to list off the standard beer from their city such as Alhambra here in Granada, Victoria in Málaga, Mahou in Madrid, etc. While I’ve certainly grown to appreciate these more over the years, my tastes still lean toward their specialty versions such as the Alhambra 1925 or Mahou Maestra. Weighing in at 6.4% and 7.5% respectively, many Spaniards have told me they’re simply too strong to enjoy but they’re more in line with what I would order in a bar back home, such as a Blue Moon (5.4%) or a Chicago Goose Island Matilda (7%). Thus, while my cultural environment has led me to believe that hoppy, fruity, and ‘complex’ flavors are what leads to a ‘good beer,’ the Spanish cultural environment seems to rely more on how palatable a beer is in terms of going down easy with some jamón y queso. Have we got you thirsty? All this talk about beer has got me in the mood to hit up my local pub and order a pint...only ordering by the pint isn’t so common here in Spain. If you’re interested in more detailed information about how to order your beer like a local, look no further—we’ve put together this video with all the information and tips you need. Enjoy! For more details, be sure to check out our post about ordering beer in Spain, too! Salud!